Yankee Wire Cloth Products has been manufacturing custom engineered parts such as wire cloth filters, expanded metal strainers and fabricated perforated metal strainer and filter components since 1963. We understand how various welds, materials and designs work with different applications. Our team will work with your engineers to provide metal filter design assistance or help develop prototypes for any style of metal filtration device imaginable. We have helped turn thousands of ideas into working metal strainer filters, strainers and screens for a wide range of industries. Click here to view our materials standards data sheets. 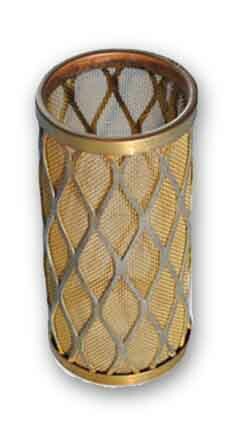 Click here to view examples of filter and strainer types. Click here to view examples of end-closure types. Whether your metal filter or strainer is just an idea scribbled on a napkin over lunch or a longstanding production run, our Mutually Agreed Upon Design approach will help deliver the best and most affordable option available. Contact us or send us a drawing to get started on your project. We meet your custom filter and strainer needs.